The SP Hunters played their best today under an overcast Port Moresby sky, losing just by 2 points to the Sunshine Coast Falcons. 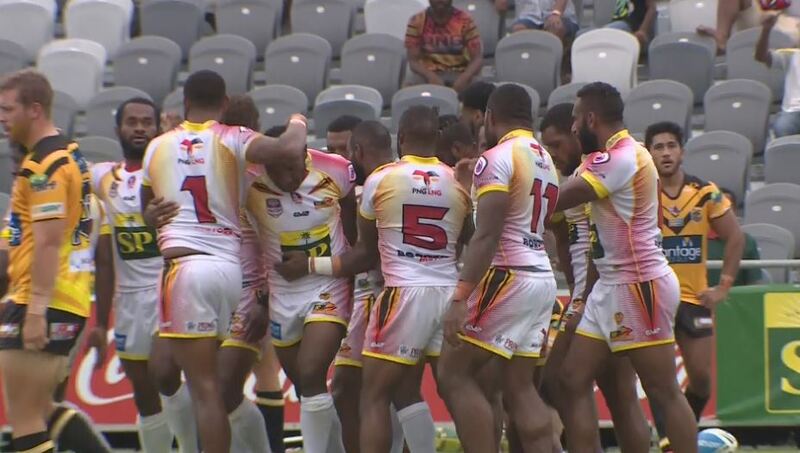 It was the SP Hunters’ best performance so far in the 2019 Intrust Super Cup season as they conceded a 26-28 defeat to the Sunshine Coast Falcons. Dane Hogan from the visitors’ side registered the first try of the round three match, 12 minutes after the starting whistle. The score was 6-nil until Junior Rau responded 4 minutes later, much to the relief of supporters at the National Football Stadium. Charlie Simon’s conversion went off mark, with the scores at 4-6. Still riding high on the waves of their first try, 20-year-old Justin Yoka, from Pangia, impressively spun around defenders to record his first try of the season. A successful conversion saw the Hunters lead by 4 points. Chris Lewis responded soon after, where Nicholas Hynes converted for a scoreline of 10-12. Six minutes later and the hosts responded through Joe Joshua, who flew over the line thanks to an impressive pass from Pangia man Yoka from the right side of the field. Daniel Tapol caught the ball on the left wing then offloaded to Joshua, who made their efforts count. Simon converted, with the points at 16-12. However, the Falcons scored another try, leaving the score at 16-18 as the teams went for break. The Falcons’ Daniel Dole scored soon after the game resumed. Another successful conversion by Hynes saw the visitors extend their lead by 8 points. The Hunters did not give up hope after another try by the visitors, which saw Joe Joshua score another two tries before the final whistle. The final score was 26-28. The SP Hunters will challenge the Easts Tigers in round 4 next Saturday at Langlands Park, Brisbane.